Letters and Papers, Foreign and Domestic, Henry VIII, Volume 9, August-December 1535. Originally published by Her Majesty's Stationery Office, London, 1886. 806. Adam Becansaw, priest, and John Vaughan to Cromwell. 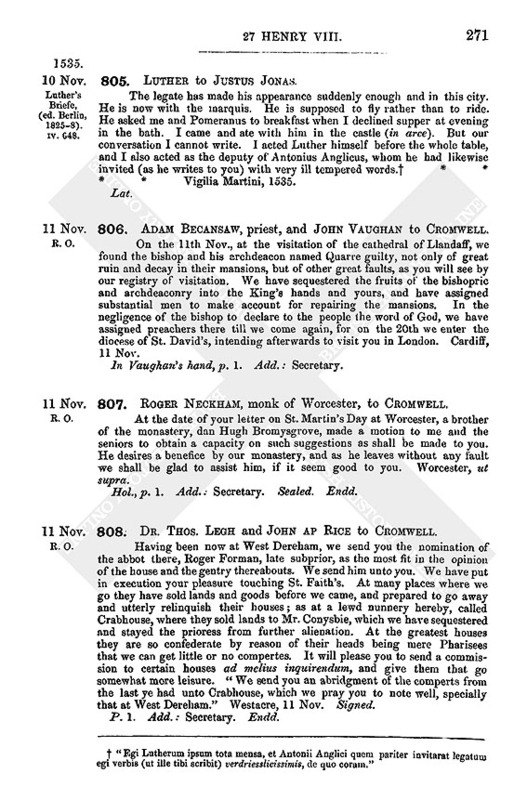 On the 11th Nov., at the visitation of the cathedral of Llandaff, we found the bishop and his archdeacon named Quarre guilty, not only of great ruin and decay in their mansions, but of other great faults, as you will see by our registry of visitation. We have sequestered the fruits of the bishopric and archdeaconry into the King's hands and yours, and have assigned substantial men to make account for repairing the mansions. In the negligence of the bishop to declare to the people the word of God, we have assigned preachers there till we come again, for on the 20th we enter the diocese of St. David's, intending afterwards to visit you in London. Cardiff, 11 Nov. In Vaughan's hand, p. 1. Add. : Secretary. 807. Roger Neckham, monk of Worcester, to Cromwell. At the date of your letter on St. Martin's Day at Worcester, a brother of the monastery, dan Hugh Bromysgrove, made a motion to me and the seniors to obtain a capacity on such suggestions as shall be made to you. He desires a benefice by our monastery, and as he leaves without any fault we shall be glad to assist him, if it seem good to you. Worcester, ut supra. 808. Dr. Thos. Legh and John ap Rice to Cromwell. Having been now at West Dereham, we send you the nomination of the abbot there, Roger Forman, late subprior, as the most fit in the opinion of the house and the gentry thereabouts. We send him unto you. We have put in execution your pleasure touching St. Faith's. At many places where we go they have sold lands and goods before we came, and prepared to go away and utterly relinquish their houses; as at a lewd nunnery hereby, called Crabhouse, where they sold lands to Mr. Conysbie, which we have sequestered and stayed the prioress from further alienation. At the greatest houses they are so confederate by reason of their heads being mere Pharisees that we can get little or no compertes. It will please you to send a commission to certain houses ad melius inquirendum, and give them that go somewhat more leisure. "We send you an abridgment of the comperts from the last ye had unto Crabhouse, which we pray you to note well, specially that at West Dereham." Westacre, 11 Nov. Signed. Add. MS. 8,715, f. 138 b. 809. Bishop of Faenza to M. Ambrogio. Cosimo Pallavicino, brother of Father (P[ad]re) Pallavicino, who is here out of prison, went to England after his brother's liberation, and has returned. He was taken prisoner in Flanders, near Boulogne and Calais, and sent to the king of England (quel Re), who, he says, received him well. Knows that he had 300 cr. from him. Hears that [the other?] is going to England to do as much harm as a wretched fool like he can do, and that his brother left for Rome three days ago. Thinks it would be well to have him arrested. Ital., pp. 3. Copy. Headed: Al Sig M. Ambrogio, da Digiun, li 11 Novembre 1535. See Grants in November, No. 5. 811. Sir Matthew Browne to Cromwell. Thanks him for writing to the prior of St. Mary Overay for him for the parsonage he has farmed of him. Mr. Carew makes labor for the same. Begs he will call the prior before him and stay his proceedings. 12 Nov.
812. 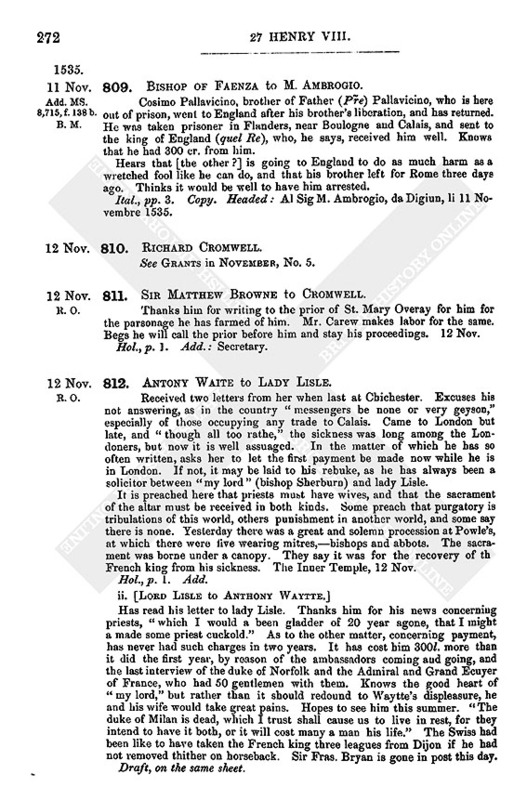 Antony Waite to Lady Lisle. Received two letters from her when last at Chichester. Excuses his not answering, as in the country "messengers be none or very geyson," especially of those occupying any trade to Calais. Came to London but late, and "though all too rathe," the sickness was long among the Londoners, but now it is well assuaged. In the matter of which he has so often written, asks her to let the first payment be made now while he is in London. If not, it may be laid to his rebuke, as he has always been a solicitor between "my lord" (bishop Sherburn) and lady Lisle. It is preached here that priests must have wives, and that the sacrament of the altar must be received in both kinds. Some preach that purgatory is tribulations of this world, others punishment in another world, and some say there is none. Yesterday there was a great and solemn procession at Powle's, at which there were five wearing mitres,—bishops and abbots. The sacrament was borne under a canopy. They say it was for the recovery of th French king from his sickness. The Inner Temple, 12 Nov.
Has read his letter to lady Lisle. Thanks him for his news concerning priests, "which I would a been gladder of 20 year agone, that I might a made some priest cuckold." As to the other matter, concerning payment, has never had such charges in two years. It has cost him 300l. more than it did the first year, by reason of the ambassadors coming and going, and the last interview of the duke of Norfolk and the Admiral and Grand Ecuyer of France, who had 50 gentlemen with them. Knows the good heart of "my lord," but rather than it should redound to Waytte's displeasure, he and his wife would take great pains. Hopes to see him this summer. "The duke of Milan is dead, which I trust shall cause us to live in rest, for they intend to have it both, or it will cost many a man his life." The Swiss had been like to have taken the French king three leagues from Dijon if he had not removed thither on horseback. Sir Fras. Bryan is gone in post this day. Draft, on the same sheet. 813. Cardinal du Bellay and Bishop of Macon to Francis I.
Rome, 12 Nov. 1535 * * * * * The Pope having heard that the kingdom of England is troubled with famine and pestilence, has determined to take prompt action. At the last Consistory one of the cardinals deputed for this purpose wished to read the sentence, which they had conceived with the intention of giving it unexpectedly. In this it appeared that there was great deceit, for, as they ultimately confessed, three months ago they were charged by the Pope to communicate it to the whole College, but they had only done it to those whom they pleased. Du Bellay remonstrated that it was not reasonable to determine the matter offhand, and it was suspended; at which the malcontents were much abashed. "Sire, la matiere court et chacun reguarda les livres." Urgent suit will be made, and the Pope is incredibly excited. I speak of it when called on as a cardinal, not as an interested person. I, the bishop of Macon, say nothing, and will not, unless commanded. We await your orders, "là où vous vouldriez, Sire, que le sort tombast;" for though it will be difficult and almost impossible to set things right, we will do our best to mitigate the evil (d'en rabattre), and to show the king of England that your servants have done their best to serve him also. Send a copy of the said sentence. Nothing like it ever was seen. It is evident that some articles are inserted for the purpose of making Francis give up either the Pope or the king of England. Francis will consider them not only malicious but unjust, "et terriblement enormes." Wish to know his intentions as soon as possible. Fr. From a modern copy, pp. 3. 814. Walter Walsh, Sheriff of Worcester. See Grants in November, No. 13. 815. Geo. Audeley to Cromwell. Had moved for his favor for the poor abbey of Hilton, which is in great decay. The King's commissioners have been there to elect an abbot, but have not done so. Begs his favor in the matter as promised, and that it may be stayed till the King's pleasure be known. One of his servants, as he has written, has been hurt by Broke, who has been struck in return. Heliecastell, 13 Nov. Signed. Close Roll 27 Hen. viii. m. 11d. Rym. xiv. 555. Surrender to the King of the Premonstratensian Abbey of St. Mary and St. Thomas the Martyr, Langdon, Kent, by Will. Dayer, abbot and the convent. Chapter-house, 13 Nov. 1535, 27 Hen. VIII. [The original signed by the abbot, sub-prior, and nine others.] Acknowledged before Thos. Bedyll, one of the clerks of Chancery in the Chapter house, 19 Nov.
27 Hen. viii. p. 1. m. 11d. Rym. xiv. 557. 1. The priory of St. Mary and St. Eanswith, Folkstone, Thos. Barret prior, 15 Nov. 1535. [Orig. signed by the prior in the name of the convent.] Acknowledged before Bedyll, 16 Nov.
2. The priory of St. Mary and St. Martin Novi Operis, Dover, John Lambert alias Folkeston, prior, 16 Nov. 1535. [Orig. signed by the prior and eight others.] Acknowledged before Bedyll the same day. 3. The priory of Merton, York dioc., Thos. Yodson, prior, 9 Feb. 1535[–6], 27 Hen. VIII. [Orig. signed by the prior and five others.] Acknowledged before Ric. Layton, one of the clerks of Chancery, the same day. 5. Priory of St. Mary, Bilsyngton, Kent, John Moyse alias Tenterden, prior, 28 Feb. 1535, 27 Hen. VIII. [Orig. signed by the prior and two others.] Acknowledged, 10 March, before Ric. Southwell, the King's commissioner. 6. Abbey of Tiltey, Essex, John Palmer, abbot, 28 Feb. 1535, 27 Hen. VIII. [Orig. signed by the abbot and five others.] Acknowledged, 3 March, before Ric. William, the King's commissioner. *** The originals of all these surrenders are in the R. O. See the Alphabetical list in Report VIII. of the Deputy Keeper of the Public Records, App. II., pp. 7–51, where the signatures are printed in full, and the condition of the seals is stated. Warrant of the King to the deputy of Calais, the Vice-Treasurer, and Surveyor, and Mayor of the Staple of the town, to deliver to Hen. Johnson, one of the gunners of the Tower of London, such iron, brick, and old iron pieces as he requires from the house of the Staplers in Calais, to be employed on the ordnance of Calais, Rysebank Castle, Newenham Bridge, Hampnes, and Guisnes. Windsor Castle, 13 Nov. 27 Hen. VIII. Signed and sealed. 818. Corneille Bogart to Cromwell. Has lately written to him for a licence to export corn out of England. Brings to his remembrance the kind promises he made to the writer when he was in that country. Would be glad of a favorable answer by the bearer. If he can do any service for Cromwell, or the "bonne nation d' Angleterre," Cromwell may command him. Berghes, 14 Nov. '35. 819. Bernardino Sandro to Starkey. Il Signore (fn. 1) and all are well, at the house of M. Donato. M. Edmondo (fn. 2) has not yet come, having gone to Sicily to buy corn. The duke of Milan died on the 2nd inst. (fn. 3) Ant. da Leva has taken possession of the duchy for the Emperor. It is said that 40,000 French are at Lyons. The French king is ill with flux and tertian fever, and more likely to die than be cured. A great war is expected shortly. Venice, 14 Nov. 1535. Ital. Hol., p. 1. Add. 820. John Graynfyld to Lord Lisle. My Lord Chancellor rode to the Court on Saturday last, when, the King being at Windsor, I moved his Lordship for your denizens. He said he was willing to gratify you, but the King was informed there were many strangers inhabited in Calais. If, however, you will send them to London I trust to speed them, if it pass not two or three; or if you send their names, and where they were born, I doubt not they will have a dedimus potestatem to your Lordship to swear them what they are worth and take their allegiance. If they be little worth the whole charge comes to 4l. 13s. 4d. of the patent, but if they be rich they must give a third of their goods. My lord wishes to know if you wish to have his house at Calais, either for yourself or your friend. He has redeemed all claims upon it. He says the master of Stannyngfyld "was favored of paying his dismes" only because you did not certify him. Commendations to my lady. Thanks Lisle for his goodness to his brother, Sir Richard Graynfyld. Hopes he may prosper in that country. London, 14 Nov.
821. Ric. 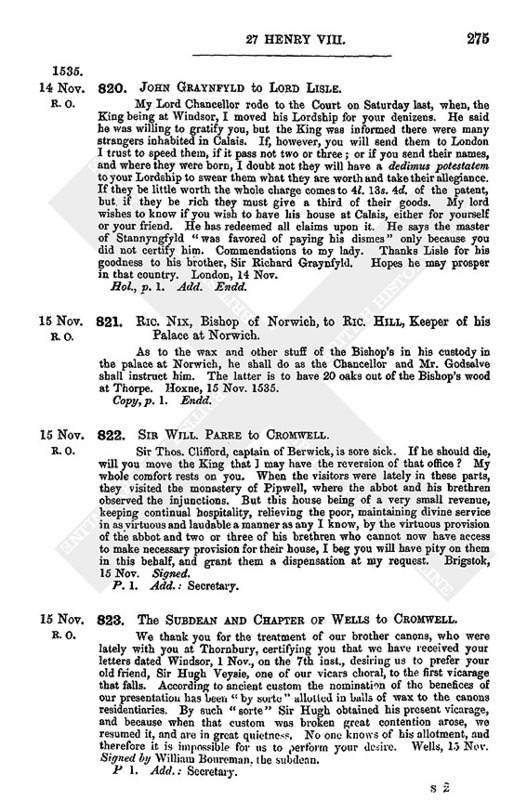 Nix, Bishop of Norwich, to Ric. Hill, Keeper of his Palace at Norwich. As to the wax and other stuff of the Bishop's in his custody in the palace at Norwich, he shall do as the Chancellor and Mr. Godsalve shall instruct him. The latter is to have 20 oaks out of the Bishop's wood at Thorpe. Hoxne, 15 Nov. 1535. 822. Sir Will. Parre to Cromwell. Sir Thos. Clifford, captain of Berwick, is sore sick. If he should die, will you move the King that I may have the reversion of that office? My whole comfort rests on you. When the visitors were lately in these parts, they visited the monastery of Pipwell, where the abbot and his brethren observed the injunctions. But this house being of a very small revenue, keeping continual hospitality, relieving the poor, maintaining divine service in as virtuous and laudable a manner as any I know, by the virtuous provision of the abbot and two or three of his brethren who cannot now have access to make necessary provision for their house, I beg you will have pity on them in this behalf, and grant them a dispensation at my request. Brigstok, 15 Nov. Signed. 823. 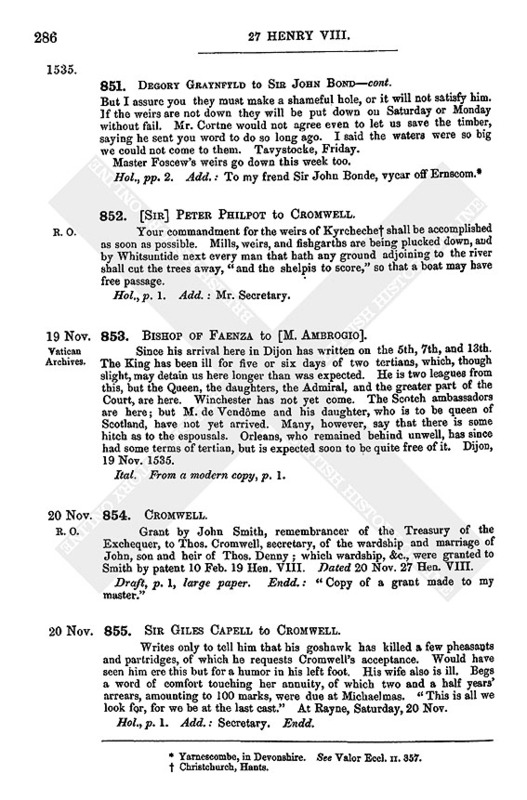 The Subdean and Chapter of Wells to Cromwell. We thank you for the treatment of our brother canons, who were lately with you at Thornbury, certifying you that we have received your letters dated Windsor, 1 Nov., on the 7th inst., desiring us to prefer your old friend, Sir Hugh Veysie, one of our vicars choral, to the first vicarage that falls. According to ancient custom the nomination of the benefices of our presentation has been "by sorte" allotted in balls of wax to the canons residentiaries. By such "sorte" Sir Hugh obtained his present vicarage, and because when that custom was broken great contention arose, we resumed it, and are in great quietness. No one knows of his allotment, and therefore it is impossible for us to perform your desire. Wells, 15 Nov. Signed by William Boureman, the subdean. News sent from Lubeck of the capture of Wullenwever, 15 Nov. 1535. Wollenweber rode out here alone without the knowledge of the Council, and came to Hamburg, from which he rode on to Buchssthehode. There he took two servants with him, and went on to Rodenborch, which belongs to the bp. of Bremen, and remained there overnight. He got drunk in the inn, "both hier aussgeschlagen die Luebschen geschulden, undt wolth in korcz einen backmeisther brengen. "He let out that he had been a powerful burgomaster of Lubeck, and would be so again in a few days. The Bishop thus discovered that he had got the bird that he had endeavoured to catch, and shut him up in a tower 9 fathoms deep, with irons about his neck, arms, and feet. He found on his person, in melted gold, 3,000 gulden, and his outfit. When questioned about the money, it was found that he was to have gone with a company of men against Holstein and with duke Albert into Denmark, but his real purpose was to have thrown himself with them into Lubeck or before it, indulged his caprice with us, and treated us after the fashion of Münster (undt auff Monstersch mith uns gehandelt haben). He has also confessed some alliances he has had with the king of Munster, and other dreadful things. He has done great damage to the bp. of Bremen, twice breaking into his land with armed bands, so that this Bishop is much incensed against him. The duke of Lauwenborch, with his Princess in person, has visited her brother, the Bishop, (fn. 4) and is strongly against him (vorfolget in starck) on their account, and also on account of their daughter the princess of Holstein; and so are the town of Bremen and the duke of Luneberg; also count Eric von der Hoehe, on account of his brother, whom he most scandalously brought to the slaughterhouse. 825. Pontanus to John Frederick Duke of Saxony. Has asked Dr. Antonius what was the object of the commission to Duke George about Cochlæus (was der befehl des Cochlei halben an Herzog G. vermochte). He told him in Philip's presence that these ambassadors and the doctor wish to discuss Cochlæus' book against the King, and, if he refuses, they have other books to publish in the King's favor in answer to him. 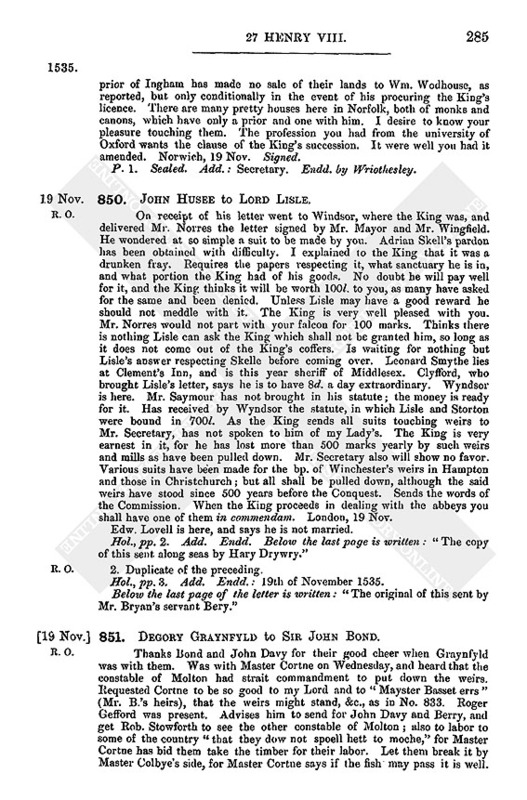 Sends a memorandum of the style of address to the king of England, translated into Latin by Philip. Antonius, Philip, and the writer talked yesterday of how and where this discussion (Beredung) of the learned men ought to be held, and advised the Duke to write to them urging its being held either at Wittenberg or Torgau. 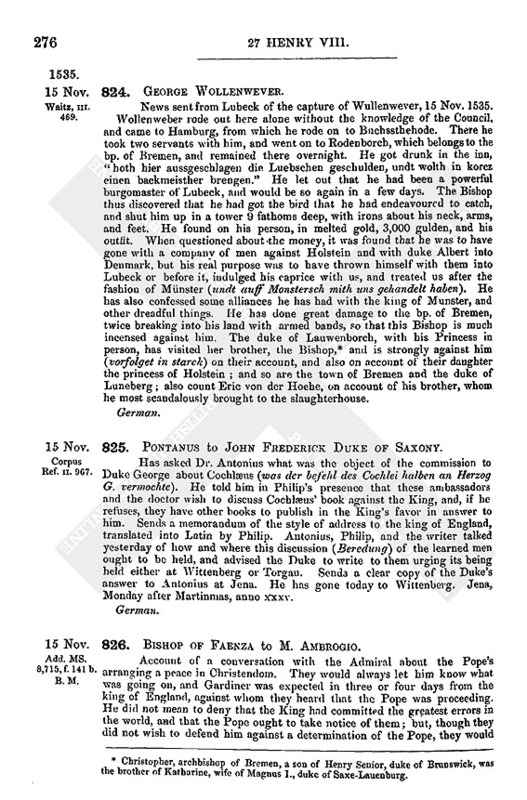 Sends a clear copy of the Duke's answer to Antonius at Jena. He has gone today to Wittenberg. Jena, Monday after Martinmas, anno xxxv. Add. MS. 8,715, f. 141 b. 826. Bishop of Faenza to M. Ambrogio. Account of a conversation with the Admiral about the Pope's arranging a peace in Christendom. They would always let him know what was going on, and Gardiner was expected in three or four days from the king of England, against whom they heard that the Pope was proceeding. He did not mean to deny that the King had committed the greatest errors in the world, and that the Pope ought to take notice of them; but, though they did not wish to defend him against a determination of the Pope, they would gladly take his part against the Emperor, because it would be to their injury to allow the Emperor to aggrandise himself, and he had spoken of this clearly to the Imperial ambassador here. 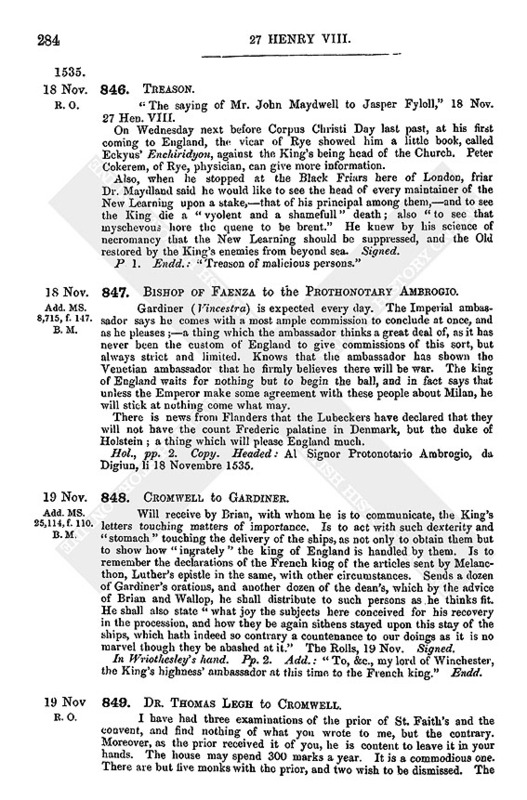 Replied that they considered that the king of England had God for an enemy, and could expect nothing but total ruin, and also he was the natural enemy of the French king, and all he did to please him was by constraint, and he (the Bishop) hoped that Francis would yet think it right to be the first to avenge the Church's injuries. The Admiral said he certainly thought the king of England must return to the right road, and that the Pope might do him great harm in the future; but that the French king, in a matter of so much importance, ought not to act against his own interests, and, moreover, that the Emperor was the man to take charge of the affair. Ital., pp. 1. Copy. Headed: Al Signor M. Ambrogio, da Digiun li 15 Novembre 1535. 827. Charles V. to Cifuentes. A long account of the interview of Don Pedro Loys Farnedyo with the Emperor. The matters first touched on were the expedition against the Turk and the Council. Don Pedro also spoke of the king of England; his Holiness's proceedings against him for having withdrawn from obedience to the Church of Rome; the shameful death of the cardinal of Rochester and other churchmen; and the King's chastisement, in which the French king had offered to assist if the Emperor would do the same. Replied that the Pope might be sure that he would not fail in his duty, as he has often said to the Nuncio, and as Cifuentes had already said to the Pope. There is no reason to doubt the Emperor, as there is the French king, considering the favor he has always shown to the king of England. At the negotiations at Calais he made no difficulty on account of the renunciation of obedience, but only about the marriage of the Princess with the Dauphin. Ever since Fisher's death he has kept up the same friendship, so that the Pope should have something more to trust to than general words,—an authentic writing, and such good security that he could not change or back out. Otherwise the Pope must not think that Francis would ever declare himself, considering how he has supported Henry through his divorce, and shown tacitly and expressly that he wanted his help. It is certain that if the French king would leave the king of England, the latter would at once submit to the Pope's mercy, for he is in great fear, both of his neighbours and of his subjects. The Pope must remember that the general expressions of Francis as to giving help conditionally are only to gain time and to make the Emperor declare war openly against England so as to get better terms himself. The other subjects on which Don Pedro spoke were the Pope's offer to endeavour to procure a better understanding between the Emperor and the French king (in answering which the Emperor referred to his proposal to procure the marriage of the princess Mary with the duke of Angouleme, if the French king would resign Italy); the affair of Camerino; the papal provision for the bishopric of Jahen; matches proposed between the prince of Piedmont and Don Pedro's daughter, and between the daughter of Savoy and Don Pedro's son; the government of Sienna, and other matters not connected with England. Fr. Headed: "Copie de la copie de la lettre de l'empereur au Conte de Cifuentes son ambassadeur a Rome ecrite a Morano en Calabre a la mi Nov. 1535. From a modern copy, pp. 14. 828. John Anthony to Cromwell. Received Cromwell's letter to Mr. Bedell, Henry Polsted, and himself, this Tuesday evening, at Dover; whereupon carried it to Canterbury to Bedell and Polsted. Is informed that the archbishop of Canterbury has written, or intends to write, to Cromwell, that Dr. Thorenden may be restored to his wardenship of the manors of Christchurch. Could show strong reasons against this if he were with Cromwell. Canterbury, Tuesday, 16 Nov. Hol., p. 1. Add. : "Secretary." Endd. Cleop. E. iv. 219. B. M. Wright's Suppression of the Monasteries, 88. 829. Thos. Bedyll, Hen. Polsted, and John Anthony to Cromwell. We received your letter this Tuesday about 7 p.m., by John Antony your servant; before its receipt we had taken surrenders of Langdon, Dover and Folkestone under their convent seals. We have received into your hands their convent seals and their evidences. We have left the canons and monks, without any clear discharge, at liberty to abide or go. Most of them desire capacities, and they are "(as we trust and think)" still in their houses. The inventories were taken already. The house of Langdon is in decay, the abbot unthrifty, and his convent ignorant. Dover is well repaired, and the prior has reduced the debt from 180l. to 100l., "of whose nowe case divers of the honest inhabitants of Dover show themselves very sorry." Folkestone is a little house, well repaired, and the prior a good husband and beloved by his neighbours. Harry Polsted, John Antony, and Antony Ager shall accomplish your letter with speed. Canterbury, 16 Nov. Signed. Pp. 3. Add. : Mr. Secretary. Endd. 830. Richard Spery to Mr. Valentyn. I send you by the bearer the obligations and discharges for victuals and billets for the year past, from port to port within the realm. May.—Obligations for discharge: From London, John van Lare, 27 May anno 27, and 13 May, and Walter Sandwyche, 27 May. June.—Obligations for discharge: From Lyne, John Pyke, 18 June. From London, Ric. Wade for Wm. Nelson, 24 June, and John van Lare, 24 June. July.—Obligations for discharge: From London, John van Spayn, 15th; Wm. Nelson, 17th and 29th; Ric. Tye, 13th; Thomas Bekynsall, 11th; Ric. Thomson for John Kyng, 16th; Robt. Assheman, 11th; John Rolfe for John Grene, 23rd; and James Quyke, 11th. From Feversham, Wm. Nelson for Bekensal, 29th; and John Bone, 28th. From Sandwyche, John Ambrose, 28th. From Yarmouth, John Pyke for Rob. Pyke, 28th. August.—Obligations for discharge: From London, Wm. Nelson, 18th, 15th, and 18th; Thomas Bekynsall, 13th and 17th; John Bone, 31 Aug.; Thomas Leper, 15th; Edmond Welman, 19th and 30th; and Ric. Fowler, 30th. 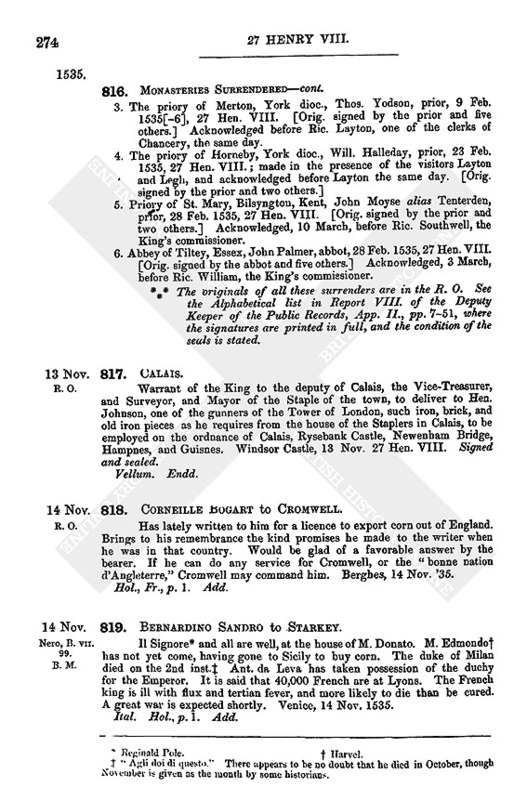 September.—Obligations for discharge: From London, Wm. van Tongham, servant of Jakes due Priour, 5th; Herry Johnson for Thomas Braye, 14th; John Assheman for Jakes due Pryour, 14th; and John Assheman for John Grene, 14th. From Sittingbourne, John Bone, on the 18th. 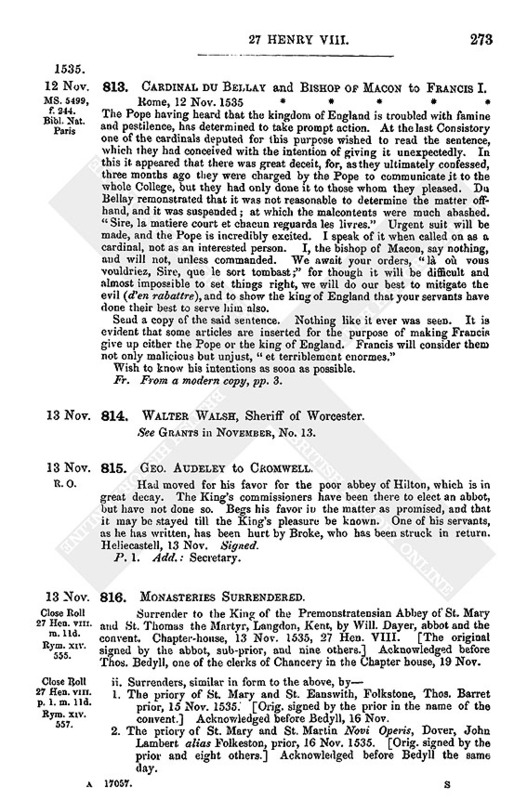 October.—Obligations for discharge: From London, Wm. Nelson, 15th. 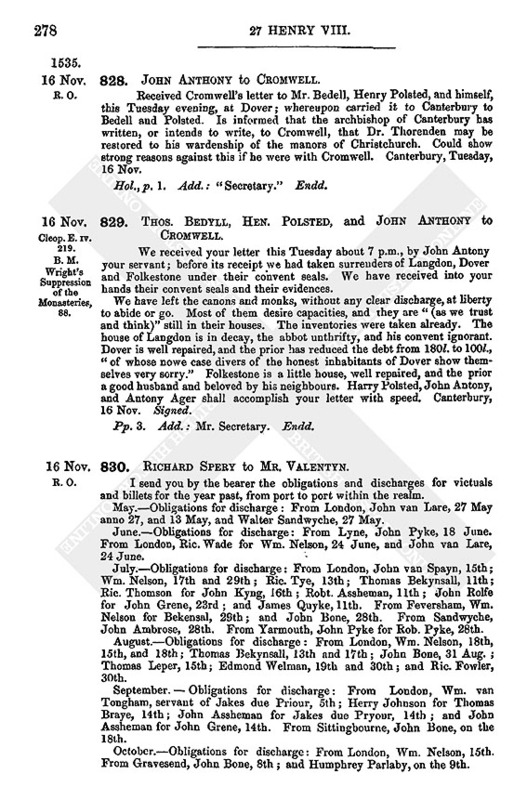 From Gravesend, John Bone, 8th; and Humphrey Parlaby, on the 9th. Calais (in another hand).—Discharges for Oliver Est: 19 Jan. 26 H. 8., 20 Ap., 26 H. 8. 6 March 26 H. 8. (John Dovace), 12 July a° 26 (sic) (Herry Drory), and 26 June 27 H. 8. I have yet a hundred obligations of the same kind remaining, which you may send for if you require. I would all persons in Essex who have taken bonds had to answer for them as I have. "Remember me to Mr. Stokfysshe for the matter ye wot of." Colchester, 16 Nov. 27 Hen. 8. Hol., pp. 2. Narrow paper. 831. Christiern [III.] Elect of Denmark to Henry VIII. Has received his letter complaining of the taking of 13 English merchant ships. During Christiern's absence in Swevenlande certain ships came into the hands of his mariners. Was not contented therewith, but what was done could not be changed. Henry must not think this was done from evil will, for he is not so oblivious of benefits that he would lose the amity late begun between them. On boldness of this amity has reserved three ships for his use against his enemies. Henry knows what wars he has had for two years, chiefly with Lubeck, which was most regarded among the cities confederate with Frederick king of Denmark, his parent, who was wont to remit his own right to it, and gladly granted anything they required. This gentleness they acquit by trying to expel Christiern and his young brethren from their country. Has retained the ships to prevent this their purpose. Doubts not the King will allow the acts. Our castle of Gottorp, 16 Nov. 1535. 832. Thomas Prior of Christchurch, Canterbury, to Cromwell. Thanks him for his great goodness towards himself and his brethren, especially for the letter touching the injunctions left by Dr. Layton. Till it arrived the brethren were in doubt where they should dine and take their refection; but now they are content to follow Cromwell's commands. Begs credence for the bearer. Canterbury, Wednesday, 17 Nov. Signed. P. 1. Add. : Secretary. Sealed. Endd. 833. Degory Graynfyld to Lord and Lady Lisle. Was with Master Cortney on Wednesday after St. Martin's Day, and desired him that your, "werres" (weirs) of Ombarly might stand before Christmas; which he said could not be, as he had received privy letters from the King, and when he was in the Court "he dar say nowother (no other) bott all the werres wer doun in Devonsherar (Devonshire)." On being requested not to pull them down entirely, but to leave a small hole in them, in the event of Lisle obtaining a licence from the King to let them stand, he refused. Supposes they have been put down, as he gave short command to the constable to that effect. Hears that my lord of Daubeney does as much as he may to put away my cousin Bassett's inheritance; "therfore your consell a bow most looke wysly to, but now he ys desayssyd." His bailiffs in the West are also to blame; also Ric. Harres, as no repairs have been made these three years. If he leaves the paling of the park of Ombarly to the writer and Sir John and John Davy, it shall be well done. Sir John is still in bed. He and Master Basset's friends "tacked bye" the putting down of the weirs, Exsatter, Wednesday after St. Martin's Day. "Newys there ys noyn, but only Mayster Cortne ys soon shalbe bushop off Exsatter, and mayster, hys father, shall occopy the roym wyell he ys with yn age. (fn. 5) Allso the hawcke that my lorde gayff me ys departett to my lorde of Suffeack." Hol., pp. 2. Add.. Lord and Lady Lysle. 834. Duke of Saxony to the English Ambassadors. "Responsum dandum legatis Regis Angliæ, 1535." The Princes and orders of the empire allied in the cause of religion thank the king of England for having sent the embassy. They consider the retention and propagation of the pare Gospel their duty to God and the Church, as they seek nothing but to glorify Christ and restore pious and sound doctrine in accordance with Holy Scripture. Though they have suffered much from those who hate the Gospel, they have always been resolved by no means to forsake the true doctrine of religion, but rather to defend and extend it to the utmost of their power. They have given no occasion for such injuries and insults, except by their disapproval of the impious rites and opinions defended by the Pope. The King may be assured that they will take every care to defend and spread this doctrine, and that they will never depart from the truth. They are pleased to hear that the King intends to aid this cause, and has uprooted in his kingdom the authority and tyranny of the Pope, and they pray him to continue in this opinion. 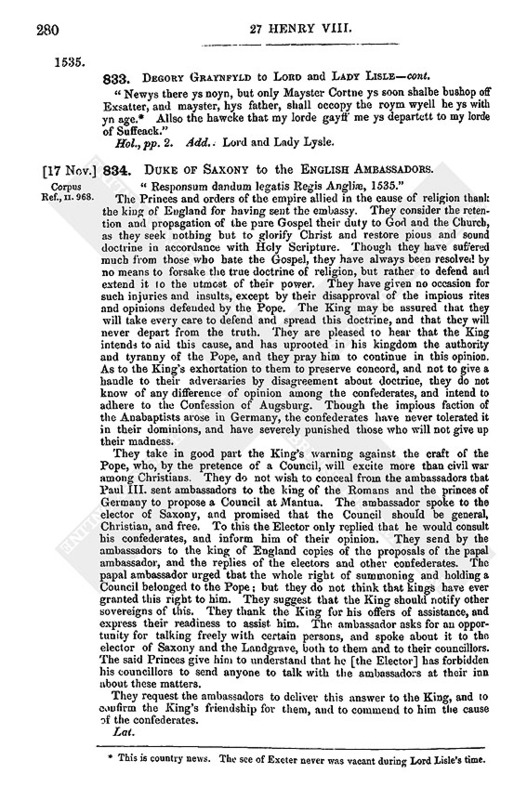 As to the King's exhortation to them to preserve concord, and not to give a handle to their adversaries by disagreement about doctrine, they do not know of any difference of opinion among the confederates, and intend to adhere to the Confession of Augsburg. Though the impious faction of the Anabaptists arose in Germany, the confederates have never tolerated it in their dominions, and have severely punished those who will not give up their madness. They take in good part the King's warning against the craft of the Pope, who, by the pretence of a Council, will excite more than civil war among Christians. They do not wish to conceal from the ambassadors that Paul III. sent ambassadors to the king of the Romans and the princes of Germany to propose a Council at Mantua. The ambassador spoke to the elector of Saxony, and promised that the Council should be general, Christian, and free. To this the Elector only replied that he would consult his confederates, and inform him of their opinion. They send by the ambassadors to the king of England copies of the proposals of the papal ambassador, and the replies of the electors and other confederates. The papal ambassador urged that the whole right of summoning and holding a Council belonged to the Pope; but they do not think that kings have ever granted this right to him. They suggest that the King should notify other sovereigns of this. They thank the King for his offers of assistance, and express their readiness to assist him. The ambassador asks for an opportunity for talking freely with certain persons, and spoke about it to the elector of Saxony and the Landgrave, both to them and to their councillors. The said Princes give him to understand that he [the Elector] has forbidden his councillors to send anyone to talk with the ambassadors at their inn about these matters. They request the ambassadors to deliver this answer to the King, and to confirm the King's friendship for them, and to commend to him the cause of the confederates. Add. MS. 8,715, f. 145b. 835. Bishop of Faenza to M. Ambrogio. * * * Tomorrow Langey departs for Germany to treat with others than Melanchthon, who, he hears, complains that the King has published the articles that he sent here (li capitoli ch'ei mando qui), especially that de potestate Pontificis. In fact they are confirmed heretics. Is told he has lately published a book on theology, and dedicated it to the king of England. This is a pretty good symptom of his mind. Ital., pp. 3. Copy. Headed: Al Signor Mons. Ambrogio da Digiun li 17 Nov. 1535. "First, to remember Bastyan Pynto for the signature of his letters.—Item, to show the King the instructions for Master Bryan, with the letter to my lord of Winchester.—Item, to procure the signature of the letters to my lord of Hereford.—Item, letters to Frederyke Palentyne.—Item, letters to Laurence Staber.—Item, letters of answer to my lord of Cumberland.—Item, letters of answer to Mr. Skevyngton.—Item, letters of answer to Brabazon.—Item, Master Nores' bills to be assigned.—Item, the bills for sheriffs to be assigned.—Item, Gostwyke's warrant to be assigned.—Item, a letter to be devised, to be written by the King's own hand, to the French king.—Item, to remember Dr. Layton and the treasurer of York for the deanery.—Item, the letters for the under-sheriff of London.—Item, the bill for Brakenbury.—Item, the bill for the Northernman for Heron's farm.—Item, the depeche of the duke of Gueldres' man.—Item, touching the provision for ropes to be made by Gonstone.—Item, for the depeche of Christopher Mounte." In Cromwell's hand. Endd. : "Remembrances." 837. Henry VIII. to James Mendiz Benvenisti. Has felt great satisfaction in being assured by Sebastyan Roderico Pynto, knight, that Benvenisti has not only escaped but broken the mischievous snares "pretended" to him, and has repurged his innocency. As we have interceded for you and declared your integrity, "we now must much more love you than we did before." Assures him that if he come to England, or send thither his goods or factors to trade, they shall be as safe as if he had them there. Draft, p. 1. Endd. : "Minutes of letters to the king of Portugal;"—to which is added in a more modern hand, "and his answer." Add MS. 25,114, f. 104. 838. Henry VIII. to [Gardiner and Wallop]. Is sending Sir Francis Brian, gentleman of the Chamber, to the French king, to set forth certain practices with the queen of Navarre, which he thinks convenient should be declared to him after Brian has travailed with the Queen and found her inclinable. 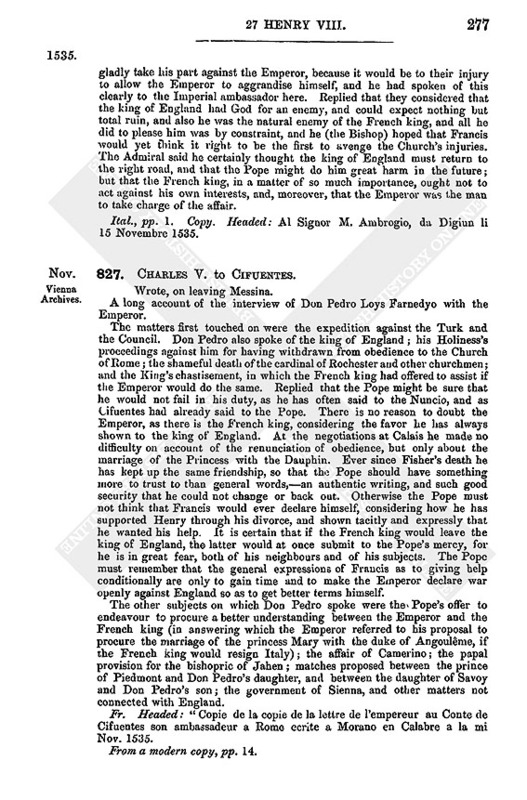 After some communication Gardiner shall take occasion to inquire of Francis whether he be earnestly resolved to make war upon the Emperor, and, if so, tell the King a stipulation Henry desires to have kept secret. He shall then say unto him that "being advertised out of France that this his disease grew partly at this time unto him of melancholy and displeasure for that he could not yet meet with the Emperor," who unjustly detains his inheritance of Milan, remembering by what means the said Emperor prevails, Henry is enforced to signify the same and suggest the remedy. He is told that the causes of the Emperor's victory are the Admiral and the Great Master, who have gathered abundance of riches, are resolved against war, and advise the King to practise with the Almains, the Italians, and the Swiss, rather than attempt to recover his own. Matters cannot long remain in this state. The duke of Wittemberg, who has lately been restored, is now feodary to his enemy Fernando duke of Austria. The landgrave of Hesse is captain-general. He has spent his money for no purpose on the duke of Bavaria, and has thus put a sword into his enemy's hand. Gardiner shall urge him to stop these practices, and not allow a foreign usurper to rob him of his due. If he would mark Henry's proceedings he would see how kings have been deluded, and how easy it should be for him, with the inestimable treasure he should receive, to recover his own, maugre his enemies; but this will not be accomplished by those who are set on their own pleasure, or be else members of the papistical kingdom. Gardiner shall proceed as he sees the King inclined, "ever interlacing that as this matter touching the Admiral and the Great Master has been reported, so we in no wise can believe it," egging him on to follow Henry's example towards the bishop of Rome and the clergy. As he is tender and sickly, Gardiner shall, if he sees a likelihood, "require, in consideration of our good brother's debility and weakness, to have the Dauphin bound for the performance of this treaty," so that he may be bound in honor at least, however God dispose of his father, though the law be ineffectual. He is to communicate with Sir Francis Brian on his arrival at the French Court as if he were in joint commission, that he may be able to make his answers conformable to the King's wishes, "though he shall dissimule the notice of that matter." Has received by Sir John Wallop news of Almain, written to Langey, touching the Emperor's declaration of the invalidity of the gift of Constantine to the Pope, declared in the Council at Spires, which, as card. Du Bellay writes, has put the Pope into such fear, not without cause, that he will be glad to be reconciled with England if it will join with France in his defence against the Emperor. 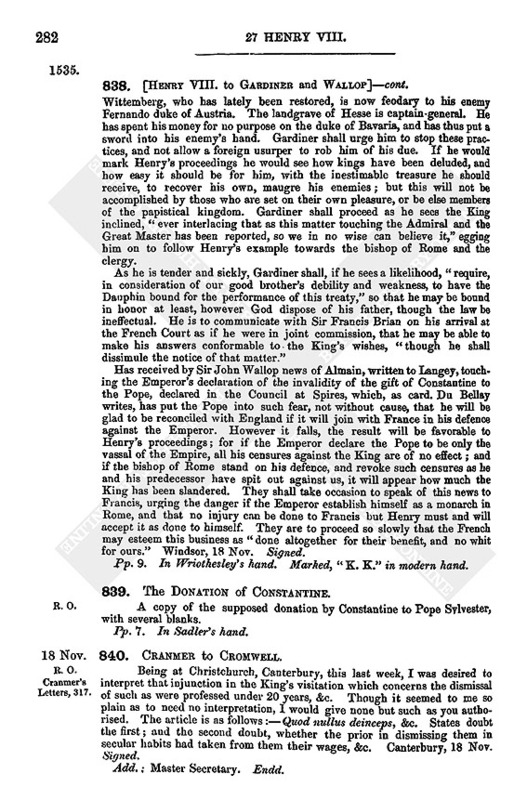 However it falls, the result will be favorable to Henry's proceedings; for if the Emperor declare the Pope to be only the vassal of the Empire, all his censures against the King are of no effect; and if the bishop of Rome stand on his defence, and revoke such censures as he and his predecessor have spit out against us, it will appear how much the King has been slandered. They shall take occasion to speak of this news to Francis, urging the danger if the Emperor establish himself as a monarch in Rome, and that no injury can be done to Francis but Henry must and will accept it as done to himself. They are to proceed so slowly that the French may esteem this business as "done altogether for their benefit, and no whit for ours." Windsor, 18 Nov. Signed. Pp. 9. In Wriothesley's hand. Marked, "K. K." in modern hand. 839. The Donation of Constantine. A copy of the supposed donation by Constantine to Pope Sylvester, with several blanks. Pp. 7. In Sadler's hand. R. O. Cranmer's Letters, 317. 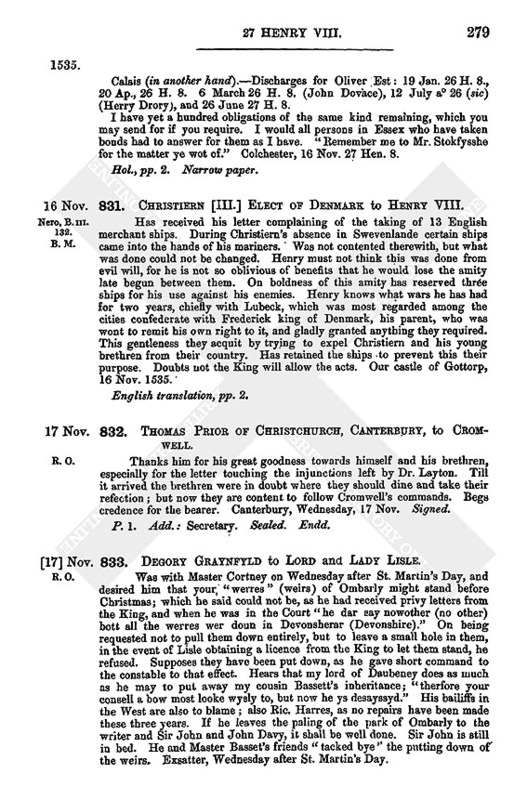 Being at Christchurch, Canterbury, this last week, I was desired to interpret that injunction in the King's visitation which concerns the dismissal of such as were professed under 20 years, &c. Though it seemed to me so plain as to need no interpretation, I would give none but such as you authorised. The article is as follows:—Quod nullus deinceps, &c. States doubt the first; and the second doubt, whether the prior in dismissing them in secular habits had taken from them their wages, &c. Canterbury, 18 Nov. Signed. 841. Roland Lee, Bishop of Coventry and Lichfield, to Cromwell. I beg you to remember my letters for the repairs at Ludlow, and encourage Mr. Englefield by your good words to return shortly after Christmas. I hear that ill reports have been made to you of Dr. Ellis. I beg you will hear him, as he is young, and no tree grows to be an oak at the first day. The scarceness of grain arises daily, and causes more robberies. We shall have on Monday a gaol delivery. Packington and Vernon are here. Ludlow, 18 Nov. Signed. P. 1. Add. : Mr. Secretary. Endd. 842. Ric. 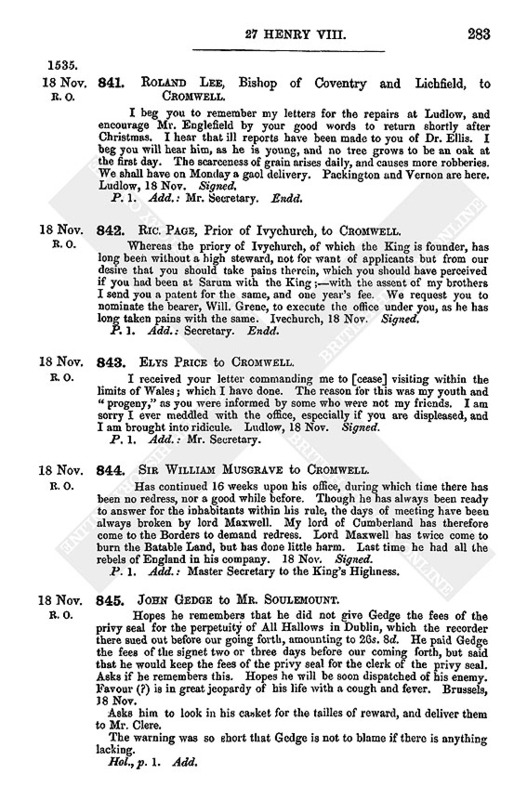 Page, Prior of Ivychurch, to Cromwell. 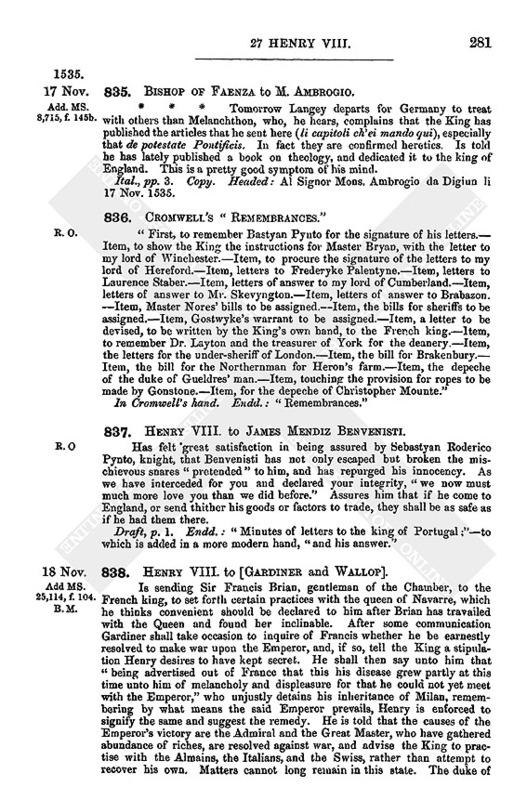 Whereas the priory of Ivychurch, of which the King is founder, has long been without a high steward, not for want of applicants but from our desire that you should take pains therein, which you should have perceived if you had been at Sarum with the King;—with the assent of my brothers I send you a patent for the same, and one year's fee. We request you to nominate the bearer, Will. Grene, to execute the office under you, as he has long taken pains with the same. Ivechurch, 18 Nov. Signed. 843. Elys Price to Cromwell. I received your letter commanding me to [cease] visiting within the limits of Wales; which I have done. The reason for this was my youth and "progeny," as you were informed by some who were not my friends. I am sorry I ever meddled with the office, especially if you are displeased, and I am brought into ridicule. Ludlow, 18 Nov. Signed. 844. Sir William Musgrave to Cromwell. Has continued 16 weeks upon his office, during which time there has been no redress, nor a good while before. Though he has always been ready to answer for the inhabitants within his rule, the days of meeting have been always broken by lord Maxwell. My lord of Cumberland has therefore come to the Borders to demand redress. Lord Maxwell has twice come to burn the Batable Land, but has done little harm. Last time he had all the rebels of England in his company. 18 Nov. Signed. P. 1. Add. : Master Secretary to the King's Highness. 845. John Gedge to Mr. Soulemount. Hopes he remembers that he did not give Gedge the fees of the privy seal for the perpetuity of All Hallows in Dublin, which the recorder there sued out before our going forth, amounting to 26s. 8d. He paid Gedge the fees of the signet two or three days before our coming forth, but said that he would keep the fees of the privy seal for the clerk of the privy seal. Asks if he remembers this. Hopes he will be soon dispatched of his enemy. Favour (?) is in great jeopardy of his life with a cough and fever. Brussels, 18 Nov.
Asks him to look in his casket for the tailles of reward, and deliver them to Mr. Clere. The warning was so short that Gedge is not to blame if there is anything lacking. "The saying of Mr. John Maydwell to Jasper Fyloll," 18 Nov. 27 Hen. VIII. On Wednesday next before Corpus Christi Day last past, at his first coming to England, the vicar of Rye showed him a little book, called Eckyus' Enchiridyon, against the King's being head of the Church. Peter Cokerem, of Rye, physician, can give more information. Also, when he stopped at the Black Friars here of London, friar Dr. Maydland said he would like to see the head of every maintainer of the New Learning upon a stake,—that of his principal among them,—and to see the King die a "vyolent and a shamefull" death; also "to see that myschevous hore the quene to be brent." He knew by his science of necromancy that the New Learning should be suppressed, and the Old restored by the King's enemies from beyond sea. Signed. P 1. Endd. : "Treason of malicious persons." Add. MS. 8,715, f. 147. 847. Bishop of Faenza to the Prothonotary Ambrogio. Gardiner (Vincestra) is expected every day. The Imperial ambassador says he comes with a most ample commission to conclude at once, and as he pleases; —a thing which the ambassador thinks a great deal of, as it has never been the custom of England to give commissions of this sort, but always strict and limited. Knows that the ambassador has shown the Venetian ambassador that he firmly believes there will be war. The king of England waits for nothing but to begin the ball, and in fact says that unless the Emperor make some agreement with these people about Milan, he will stick at nothing come what may. There is news from Flanders that the Lubeckers have declared that they will not have the count Frederic palatine in Denmark, but the duke of Holstein; a thing which will please England much. Hol., pp. 2. Copy. Headed: Al Signor Protonotario Ambrogio, da Digiun, li 18 Novembre 1535. Add. MS. 25,114, f. 110. Will receive by Brian, with whom he is to communicate, the King's letters touching matters of importance. Is to act with such dexterity and "stomach" touching the delivery of the ships, as not only to obtain them but to show how "ingrately" the king of England is handled by them. Is to remember the declarations of the French king of the articles sent by Melancthon, Luther's epistle in the same, with other circumstances. Sends a dozen of Gardiner's orations, and another dozen of the dean's, which by the advice of Brian and Wallop, he shall distribute to such persons as he thinks fit. He shall also state "what joy the subjects here conceived for his recovery in the procession, and how they be again sithens stayed upon this stay of the ships, which hath indeed so contrary a countenance to our doings as it is no marvel though they be abashed at it." The Rolls, 19 Nov. Signed. In Wriothesley's hand. Pp. 2. Add. : "To, &c., my lord of Winchester, the King's highness' ambassador at this time to the French king." Endd. 849. Dr. Thomas Legh to Cromwell. I have had three examinations of the prior of St. Faith's and the convent, and find nothing of what you wrote to me, but the contrary. Moreover, as the prior received it of you, he is content to leave it in your hands. The house may spend 300 marks a year. It is a commodious one. There are but five monks with the prior, and two wish to be dismissed. The prior of Ingham has made no sale of their lands to Wm. Wodhouse, as reported, but only conditionally in the event of his procuring the King's licence. There are many pretty houses here in Norfolk, both of monks and canons, which have only a prior and one with him. I desire to know your pleasure touching them. The profession you had from the university of Oxford wants the clause of the King's succession. It were well you had it amended. Norwich, 19 Nov. Signed. P. 1. Sealed. Add. : Secretary. Endd. by Wriothesley. 850. John Husee to Lord Lisle. On receipt of his letter went to Windsor, where the King was, and delivered Mr. Norres the letter signed by Mr. Mayor and Mr. Wingfield. He wondered at so simple a suit to be made by you. Adrian Skell's pardon has been obtained with difficulty. I explained to the King that it was a drunken fray. Requires the papers respecting it, what sanctuary he is in, and what portion the King had of his goods. No doubt he will pay well for it, and the King thinks it will be worth 100l. to you, as many have asked for the same and been denied. Unless Lisle may have a good reward he should not meddle with it. The King is very well pleased with you. Mr. Norres would not part with your falcon for 100 marks. Thinks there is nothing Lisle can ask the King which shall not be granted him, so long as it does not come out of the King's coffers. Is waiting for nothing but Lisle's answer respecting Skelle before coming over. Leonard Smythe lies at Clement's Inn, and is this year sheriff of Middlesex. Clyfford, who brought Lisle's letter, says he is to have 8d. a day extraordinary. Wyndsor is here. Mr. Saymour has not brought in his statute; the money is ready for it. Has received by Wyndsor the statute, in which Lisle and Storton were bound in 700l. As the King sends all suits touching weirs to Mr. Secretary, has not spoken to him of my Lady's. The King is very earnest in it, for he has lost more than 500 marks yearly by such weirs and mills as have been pulled down. Mr. Secretary also will show no favor. Various suits have been made for the bp. of Winchester's weirs in Hampton and those in Christchurch; but all shall be pulled down, although the said weirs have stood since 500 years before the Conquest. Sends the words of the Commission. When the King proceeds in dealing with the abbeys you shall have one of them in commendam. London, 19 Nov.
Edw. Lovell is here, and says he is not married. Hol., pp. 2. Add. : Endd. Below the last page is written: "The copy of this sent along seas by Hary Drywry." Hol., pp. 3. Add. Endd. : 19th of November 1535. Below the last page of the letter is written: "The original of this sent by Mr. Bryan's servant Bery." 851. Degory Graynfyld to Sir John Bond. Thanks Bond and John Davy for their good cheer when Graynfyld was with them. Was with Master Cortne on Wednesday, and heard that the constable of Molton had strait commandment to put down the weirs. Requested Cortne to be so good to my Lord and to "Mayster Basset errs" (Mr. B. 's heirs), that the weirs might stand, &c., as in No. 833. Roger Gefford was present. Advises him to send for John Davy and Berry, and get Rob. Stowforth to see the other constable of Molton; also to labor to some of the country "that they dow not spoell hett to moche," for Master Cortne has bid them take the timber for their labor. Let them break it by Master Colbye's side, for Master Cortne says if the fish may pass it is well. But I assure you they must make a shameful hole, or it will not satisfy him. If the weirs are not down they will be put down on Saturday or Monday without fail. Mr. Cortne would not agree even to let us save the timber, saying he sent you word to do so long ago. I said the waters were so big we could not come to them. Tavystocke, Friday. Master Foscew's weirs go down this week too. 852. [Sir] Peter Philpot to Cromwell. Your commandment for the weirs of Kyrcheche (fn. 7) shall be accomplished as soon as possible. Mills, weirs, and fishgarths are being plucked down, and by Whitsuntide next every man that hath any ground adjoining to the river shall cut the trees away, "and the shelpis to score," so that a boat may have free passage. Hol., p. 1. Add. : Mr. Secretary. 853. Bishop of Faenza to [M. Ambrogio]. Since his arrival here in Dijon has written on the 5th, 7th, and 13th. The King has been ill for five or six days of two tertians, which, though slight, may detain us here longer than was expected. He is two leagues from this, but the Queen, the daughters, the Admiral, and the greater part of the Court, are here. Winchester has not yet come. The Scotch ambassadors are here; but M. de Vendôme and his daughter, who is to be queen of Scotland, have not yet arrived. Many, however, say that there is some hitch as to the espousals. Orleans, who remained behind unwell, has since had some terms of tertian, but is expected soon to be quite free of it. Dijon, 19 Nov. 1535. Ital. From a modern copy, p. 1. Grant by John Smith, remembrancer of the Treasury of the Exchequer, to Thos. Cromwell, secretary, of the wardship and marriage of John, son and heir of Thos. Denny; which wardship, &c., were granted to Smith by patent 10 Feb. 19 Hen. VIII. Dated 20 Nov. 27 Hen. VIII. Draft, p. 1, large paper. Endd. : "Copy of a grant made to my master." 855. Sir Giles Capell to Cromwell. Writes only to tell him that his goshawk has killed a few pheasants and partridges, of which he requests Cromwell's acceptance. Would have seen him ere this but for a humor in his left foot. His wife also is ill. Begs a word of comfort touching her annuity, of which two and a half years' arrears, amounting to 100 marks, were due at Michaelmas. "This is all we look for, for we be at the last cast." At Rayne, Saturday, 20 Nov.
856. Roland Lee, Bishop of Coventry and Lichfield, to Cromwell. Whereas in your visitation the poor prior of Lempster, through the provocation of his abbot, was enjoined to keep the cloister as a conventual monk of small reputation; I advertise you that the said prior is of as good reputation as the abbot of Reading, and as a proof of this the abbot had intended to resign in behalf of the prior if the statute of abatement of pensions had not passed. I beg, therefore, that he may have your lawful favor, and be at liberty as other heads of religious houses are. Ludlow, 20 Nov. Signed. 857. Antony Barkar to Lady Lisle. Commendations to lord Lisle. I send a girdle of the best fashion and best "aymell" (enamel) of any I can find. If you do not like it, return it, and it shall be changed. I could find none that would less hurt your sleeves, and the wreaths upon the enamel will keep it long. My lord of Winchester pays for the overplus, which comes to 20s. st. Your son, Mr. James, is merry. I have bought him a gown, and made less his velvet bonnet. I will see that he lacks nothing till Mons. President comes. Paris, 20 Nov. 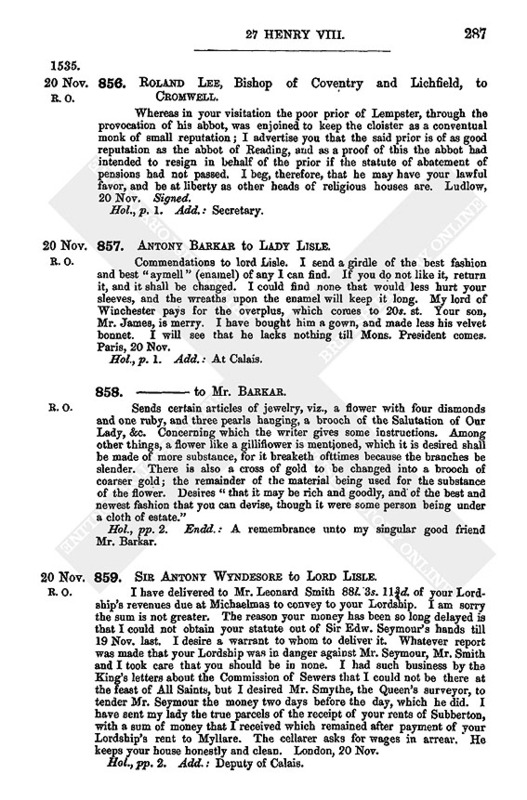 Sends certain articles of jewelry, viz., a flower with four diamonds and one ruby, and three pearls hanging, a brooch of the Salutation of Our Lady, &c. Concerning which the writer gives some instructions. Among other things, a flower like a gilliflower is mentioned, which it is desired shall be made of more substance, for it breaketh ofttimes because the branches be slender. There is also a cross of gold to be changed into a brooch of coarser gold; the remainder of the material being used for the substance of the flower. Desires "that it may be rich and goodly, and of the best and newest fashion that you can devise, though it were some person being under a cloth of estate." Hol., pp. 2. Endd. : A remembrance unto my singular good friend Mr. Barkar. 859. Sir Antony Wyndesore to Lord Lisle. I have delivered to Mr. Leonard Smith 88l. 3s. 11¾d. of your Lordship's revenues due at Michaelmas to convey to your Lordship. I am sorry the sum is not greater. The reason your money has been so long delayed is that I could not obtain your statute out of Sir Edw. Seymour's hands till 19 Nov. last. I desire a warrant to whom to deliver it. Whatever report was made that your Lordship was in danger against Mr. Seymour, Mr. Smith and I took care that you should be in none. I had such business by the King's letters about the Commission of Sewers that I could not be there at the feast of All Saints, but I desired Mr. Smythe, the Queen's surveyor, to tender Mr. Seymour the money two days before the day, which he did. I have sent my lady the true parcels of the receipt of your rents of Subberton, with a sum of money that I received which remained after payment of your Lordship's rent to Myllare. The cellarer asks for wages in arrear. He keeps your house honestly and clean. London, 20 Nov.
860. Sir Antony Wyndesore to Lady Lisle. Has delivered to Leonard Smyth the revenues of my Lord's lands due at Michaelmas last. The accounts will be sent by Mr. Smyth, the Queen's Surveyor. Is sorry the sum is so small. Has caused persons having my Lord's warrants to bear with him at this time. Advises that he should not direct any more till these be paid. Sends the money he has received from Subberton for the last half-year. Has paid Mr. Donamysse rent. There is rent remaining in Selarer's hand, by the gift of my Lord, as he saith, and some he stays for his "uagysse" and his wife's being behind. Sends his bill. He uses himself very honestly in the house. There are other rents behind in Russell's hands, and Bell's, which they say they hold by my Lord's grant. She will see what sums are paid by the rental, in which they are marked. 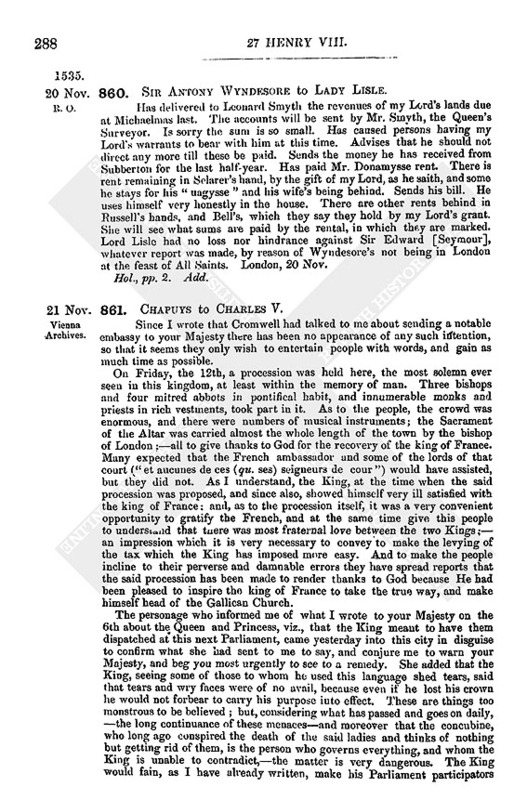 Lord Lisle had no loss nor hindrance against Sir Edward [Seymour], whatever report was made, by reason of Wyndesore's not being in London at the feast of All Saints. London, 20 Nov.
3. "Agli doi di questo." There appears to be no doubt that he died in October, though November is given as the month by some historians. 4. Christopher, archbishop of Bremen, a son of Henry Senior, duke of Brunswick, was the brother of Katharine, wife of Magnus I., duke of Saxe-Lauenburg. 5. This is country news. The see of Exeter never was vacant during Lord Lisle's time. 6. Yarnescombe, in Devonshire. See Valor Eccl. II. 357.